In a couple of other forums, I intruded onto their threads on how wonderful it is to get hand fed birdies as your sure path on the promised road to a birdie that will be very tame and tolerant of you. That the birdies will do everything including dancing the tango with you. Started of course, by people who were commercially selling unweaned birdies or selling their proudly proclaimed handfed birdies. I had to add my 2 bit. I do not believe at all the promotion of handfed birdies as being tamed and more easily bonded to people. I go even beyond that. I have very dim view on 'hand raising' of birds. That deprived the little birdie on proper interactions with its parents and designed to hopefully 'imprint' on it that he/she is a human. Are we that incapable of understanding and training with a bird that we felt compelled to rip a baby from his/her parents? This lead to the marketing and selling of birdies thats not weaned. Perhaps better the profits to the breeders, but is that a better life for the birdie? Or is a perceived easier life to us the only thing that matter? Of course, claims of 'handraising' sells especially to people who do not know and wanted something quickly. It seems too that handraised birdies later on developed serious psychological problems. 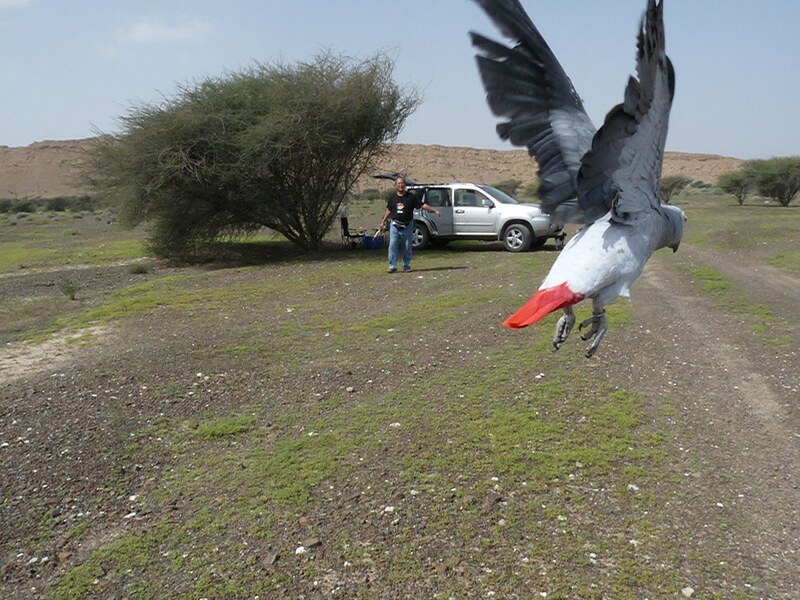 The sad part is even older birds, and birds caught from the wild, are really trainable. Riamfada was a wild caught CAG as seen in her open leg ring. She was a rescue and given to my charge when she was about 5-6 years old. She came to me bitey and fearful. In about a year, she was doing free flights to me. Yingshiong above is a white rumped shama. A shama is a songbird. He was caught from the wild at about 3 years old. He was given into my charge at about 5 years old. He flew to me on cue within a month of coming to me. Breeders of shamas with 30++ years of experience, told me even their breed shamas , some they hand raised, never ever landed on them. 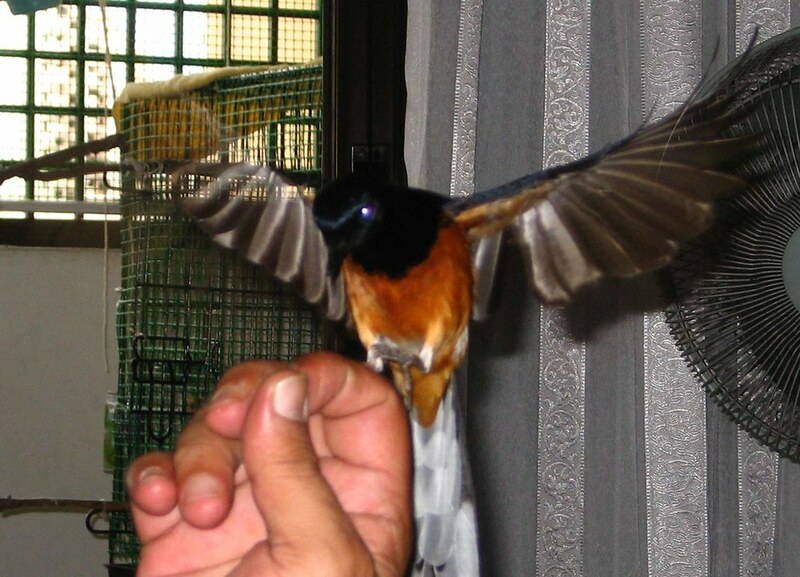 They told me above was the first ever they seen of a male shama landing on a human. Libai is a Greater Greenleaf song bird. Caught from the wild and probably about 3 years old or so when he came to me. Jackie was a Greater Indian Hill Minah. He was a wild caught and came to me at one year old. In about 4 weeks, he was coming to me on recall. 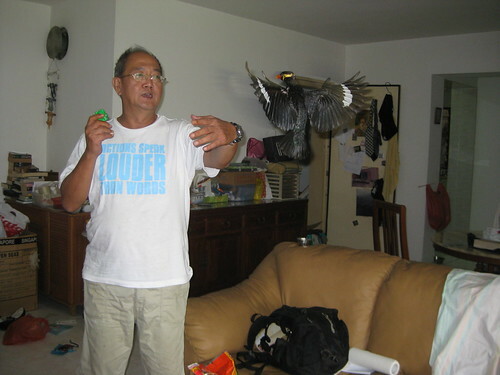 Even wild caught and old birds can be so easily trained and bonded if you know how. Understanding them is the first and most important step that can be taken. Even wild caught and old birds can be so easily trained and bonded if you give them the respect , dignity and courtesy due to intelligent sentients. But in reading that, I found it was more than that, relating the post natal caring of the birdies by its birdie parents that make a HUGE difference. That many of the problems with captive bred and handraised birdies did not exist with captured birds. That trend extended to cockatoos too. But of course, people with vested interests in selling 'handraised' birds that they make out to have greater value will always want to tell you that is the smartest and the best thing you can do. With that, I seen with sickness in my heart so many baby birds sold in birdshops with eyes still close as 'handraising' them will make them fond of you. A big lie fostered by people with vested interests. I wrote a few years ago of that in my Livejournal and the comments of others with problems on handraised birds were so disturbing. For those who still have nagging doubts that I was wrong in discouraging 'handraisded' birdies" and needed more than what Jane Hollander wrote, here is another very interesting article which underlined my concern. That was written by Micheal Doolan, an Avian vet, detailing the screaming, self mutilation, aggression and other problems. You all know I lost LiBai in June 2011. Through a series of ghastly mistakes on my part. The chief was my morbid curiosity in wondering if my watch stopped and checking if the second hand was moving when I was riding my mountain bike. After seeing Tinkerbell in Summertime2011, I got over that loss. And was thinking of another bird in my life. I still wanted a local bird. A bird that I could set free if I leave Singapore. A few months ago, I recalled reading Edmund (flyinmysoup) account of his long tailed shrike kept as a song bird. A shrike is a predator of birds. His report painted a picture of a very intelligent bird even though kept in a cage. So I thought of having a shrike this time to be my companion. I wrote a pm to him via the forum. But I did not know then he seldom go to the forum and did not see my pm to him asking about the shrike. Last Friday, 12 Aug 2011, I decided to go to a birdshop. I been there a couple weeks ago and saw they had 2 pairs of male/female Fairy bluebird. The Asian Fairy bluebird Irena puella is a very beautiful bird. The male is a shining ultramarine-blue with lilac reflections on its upper plumage, lesser wing coverts, and under tail coverts, while the sides of its head and the whole lower plumage are deep black; greater wing-coverts, quills, and tail black, and some of the coverts tipped with blue, and the middle tail-feathers glossed with blue. Fairy bluebirds are nectar, fruits and insect eaters. I saw that for the first time about 30 years ago in a birdshop and never quite fell out of love with his beautiful iridescence blue. Each pair kept in a cage. Calling them as pairs are not correct just because one is male and the other is female. If they were not compatible, they would fight. And as the female is larger, the male loses. I saw then a cage with only the female and another still having a male and female. That male was being periodically attacked by the female. The shop first wanted me to buy the pair. I felt very sorry for the male and I told them I would take the male only as it was clear the female was going to kill the male. And if they do not agree, they will end up with a dead male by next week. After a while, it was agreed to let me have just the male. I came back and weighed him in the carrier box and then just the carrier box alone. His first weight with me was 64 grams. I found he could hardly fly at all in my flight room. Just barely fluttering 2 feet above the floor. I had to place the drinks and some fruits on the floor. He was so nervous and frightened that I had to leave the flight room all together. I decided not to name him yet as I was not even certain if he remained alive. I was somewhat relieved to see that he drank some water. I had not expected to have a fairy bluebird into my life. I was so focused on keeping him alive that I did not even think of a name for him. His refusing to eat that day troubled me very much. The next day, he was flying a bit better. He managed to fly into my cat cage. I placed water bowls there and a small piece of over ripe papaya to tempt him. 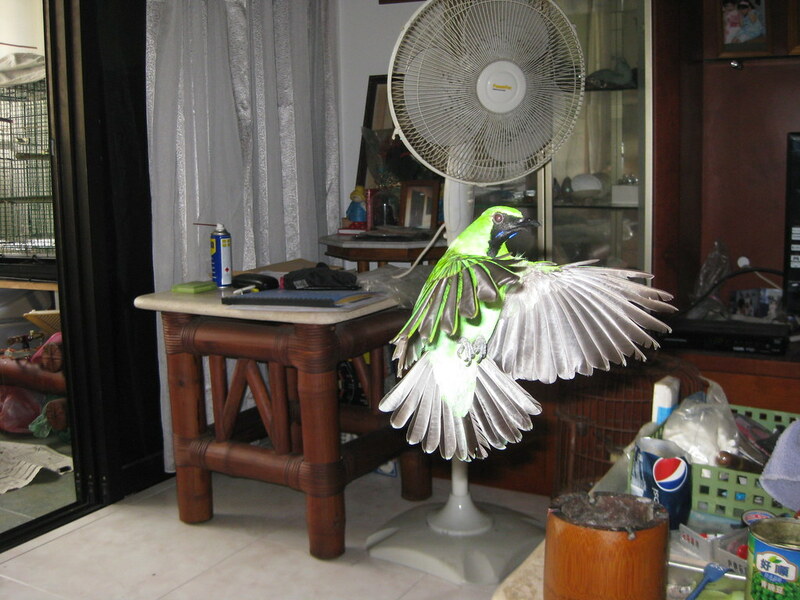 He was still extremely feral and so shy of me that I only entered the flight room to give water and papaya watching him from my living room. I was relieved to see he ate the papaya. When I entered the flight room to give yet another piece, he was frantic with fear and I left him alone. He ate the other piece as well giving me a bit more hope. And then late in the evening of Saturday, Edmund saw my message to him. He happily wrote back to me where I could find the shrike. By then, I already have the fairy bluebird. I think it was all fated. If I had not gone to that shop the day before, and seen only one male was left, and knowing he will die if I had not taken him, I would be writing of the shrike. He objected less violently on Sunday morning when I went into his room bearing a bowl of bluebird mash with a small piece of papaya to get him started. He started to eat the mash with the papaya. My old friend Cyrus came at noon. We slowly walked into the flight room. He was not happy but did not fly violently around. He finally accepted not just me, but Cyrus as well. I then went off with Cyrus. To come back late in the afternoon. And found he ate 27 grams of bluebird mash. I think he will survive now. I will be able to think of a name appropriate for that fairy now. And perhaps be willing to be my friend. No photos taken of him yet. But check on Google how beautiful they are.